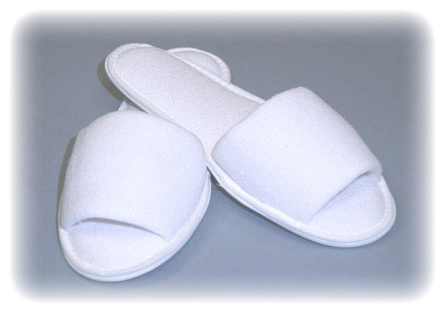 Relax your feet in these luxurious spa slippers in for men and women. Lightweight and durable, these opened-toe slippers can be conveniently machine-washed on a gentle cycle. Made of softly padded terry with anti-skid rubber soles. These make a great match with any of our robes or body wraps. Choose from women's or men's slippers in white color only. Women's One Size fits a woman's shoe size 6 through 9. Men's One Size fits a man's shoe size 9 through 13.